Usually my posts are inspired by Pinterest, but today this post is inspired my my recent trip to Paris and my luscious new cookbook, My Paris Kitchen. 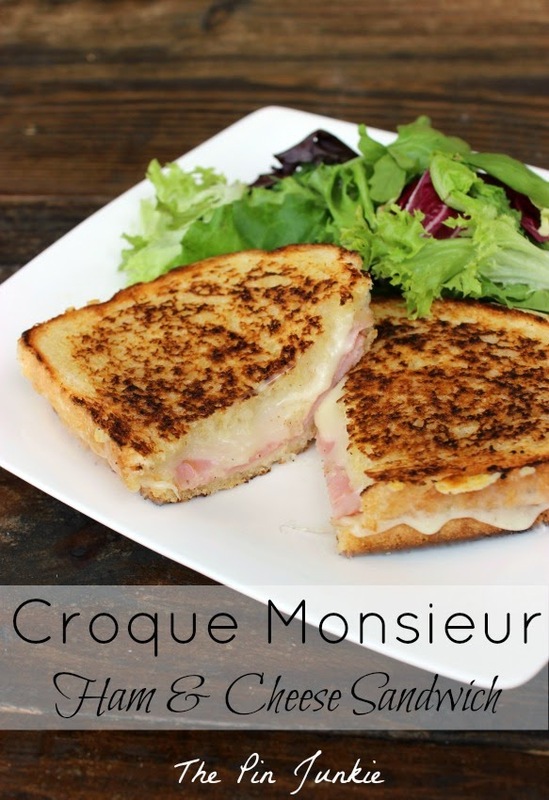 I guess this can't be called a real croque monsieur because I didn't follow the recipe exactly. So, let's just say this is my version of a croque monsieur. I didn't use authentic French cheese like Comte or Gruyere (I used Swiss), I didn't use French bread (I used sourdough) and I didn't use bechamel sauce to coat the bread before frying it (I just used lots of butter!) But one of the fun things about cooking, is tasting of course, and also deviating from the recipe and seeing what happens. In this case, something pretty tasty happened. 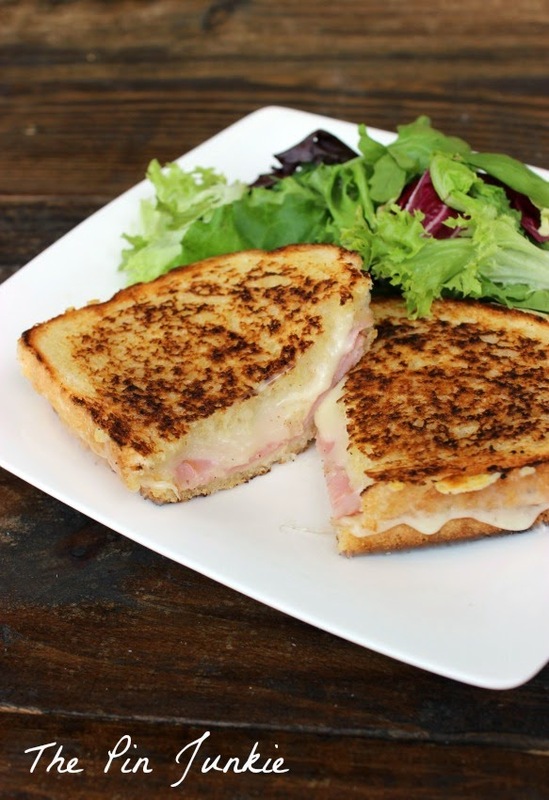 There's nothing better than biting into a toasty warm sandwich with buttery, crispy bread oozing with melty creamy cheese and salty ham. Mmmmm . . .
You want one now don't you? You're in luck because I'm sharing the recipe along with some tips to make your sandwich perfect. -The sandwich is only as good as the ingredients. To make a really good ham and cheese sandwich use the best ingredients you can find. -Use room temperature butter, rather than cold butter right out of the fridge. It makes it easier to spread. -Placing a lid over the skillet while the sandwich is cooking helps to heat it all the way through and really melt the cheese. Don't be afraid to change this very basic recipe to suite your tastes. Experiment with different types of breads and cheeses. 1. Using room temperature butter, melt one tablespoon of butter in the skillet and liberally spread one tablespoon of butter on one side of each slice of bread. 2. Place bread butter side down in skillet. Add a layer of cheese, a layer of ham, and another layer of cheese. Top with another piece of bread, butter side up. 3. Cook over medium heat approximately 3-5 minutes or until bread is lightly browned. With a spatula, flip the sandwich to brown the other side. Place a lid over the skillet to heat the sandwich all the way through and completely melt the cheese. looks super delish!! I am drooling for a bite! I love your sandwich. You are so correct about good bread. this takes me back to april, when i went to france. of course i had to try this there. yum! Thanks for pinning Linda! You're right, Paris is amazing and I hope I get to go back one day. I think this is divine!! I found your recipe over at the Tuesday’s Table link party. I host Tickle My Tastebuds Tuesday and would love it if you would come over and share this recipe. I’m sure our party goers would love it! Here is the link http://bit.ly/1kRX8Tm. Have a wonderful day! Thanks for the invitation Lori! I stopped by to share this at your party. I also added your party to my "Where I Party Page." My 16 year old son will be all over this! I can hear him say "Oh Buddy" right now. Pinned! Oh, these are yummy. I've never had them with an egg on top, but I've got to try it! 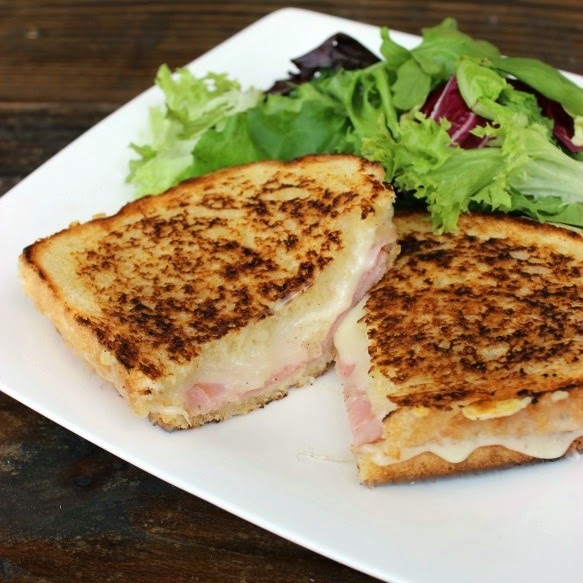 A yummy and easier version of the grilled sandwich. Yummy!!! We love making these satisfying sandwiches!!! Thanks for the recipe. This is my hubby's favorite brunch dish. Now I can make it! I crave a good ham and cheese every now and then. Usually make them after I have baked a ham. Swiss is my favorite, but I use what ever I have on hand. Yours looks delicious and I love the French name! Thanks for sharing it with SYC. This looks so delicious! Thanks for sharing at the Bloggers Brag Pinterest Party.